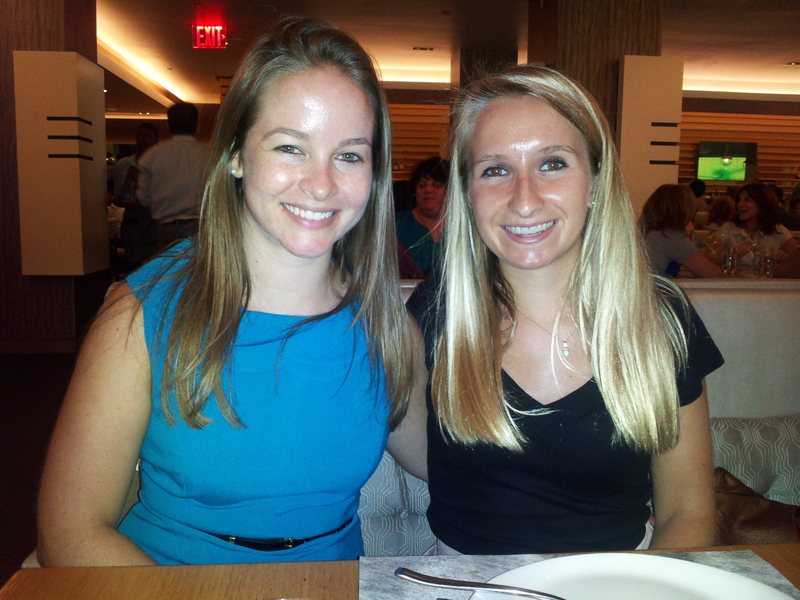 Previous: Restaurant Week has begun! First up: Co Co Sala! I was SO excited to come here for Restaurant Week dinner! I went with my two friends Lindsey and Steven. The restaurant had an open kitchen, so you could see all of the cooking taking place! Really cool. Lots of wood surfaces throughout the restaurant, Very farm-to-table. You can tell they focus on seasonal ingredients and making everything for real, from scratch. Fresh. Everything on the lefthand side is to buy a la carte. The items on the right are those available the “count” for restaurant week. You could choose a 3, 4, or 5 course restaurant week meal for basically $35, $45, or $55, respectively. We chose the 3-course option. With the 3-course option, each person selects 1 item from the fruits/vegetables & pasta; 1 item from the fish & shellfish and meat & game; and 1 item from cheese and desserts. Ah yes but before that, drinks! 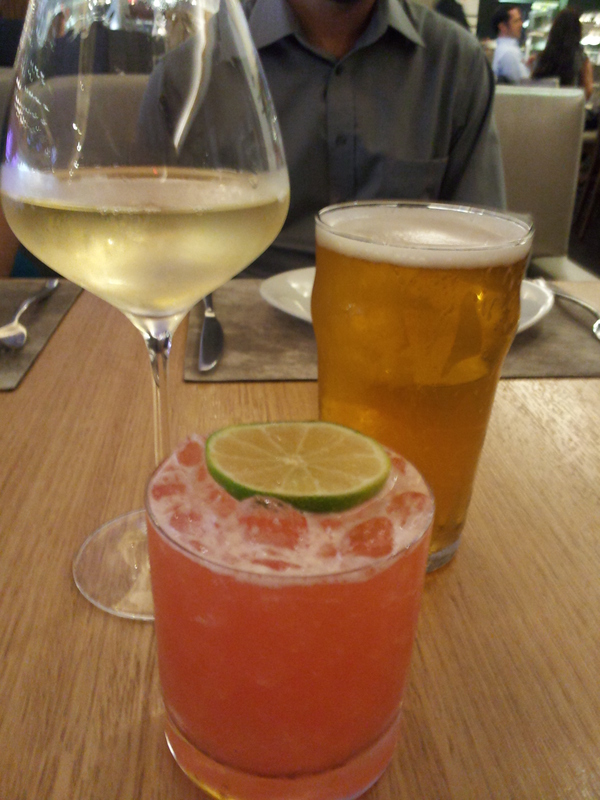 Lindsey ordered white wine; Steven ordered beer. Honestly, not sure which ones they selected, but I can say with confidence that the wine and beer lists are high quality and you won’t order anything bad from there. 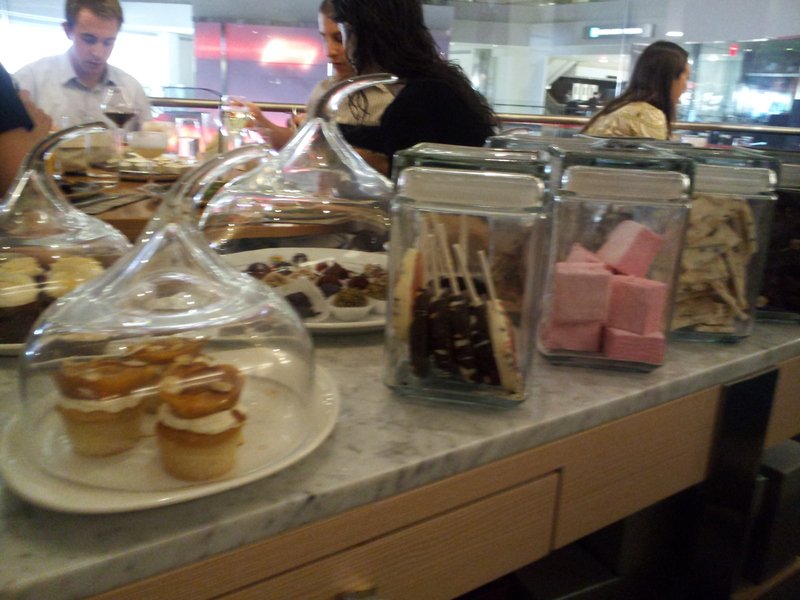 Our server was able to provide knowledgeable recommendations too. Some day, I’ve gotta try that punch. I’d imagine it’s a large bowl of punch that can be shared my multiple people. What I actually selected was the Lot Lizard, made with tequila, campari, lime, and pineapple syrup. Lindsey selected the tomato cassarecci with young zucchini ,olive, dandelion, and pesto. 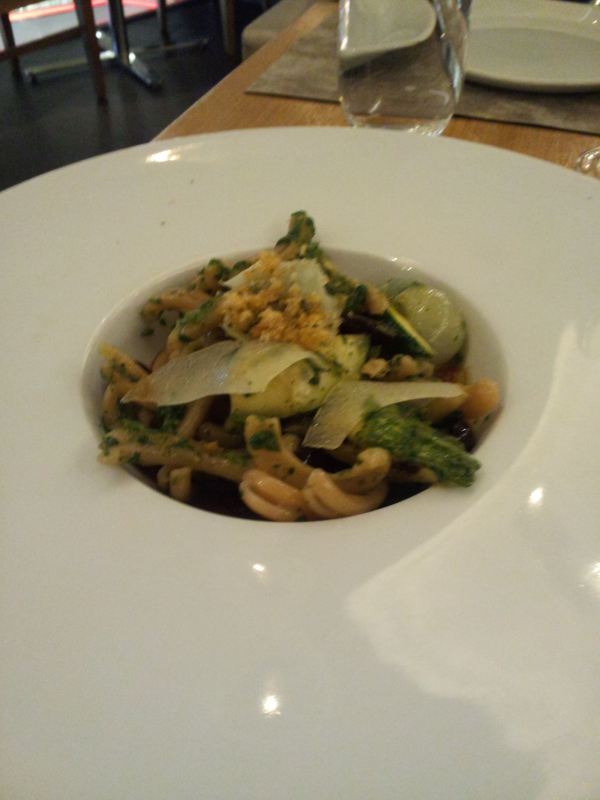 The pasta was so fresh, it was amazing! The pesto too was delicious. 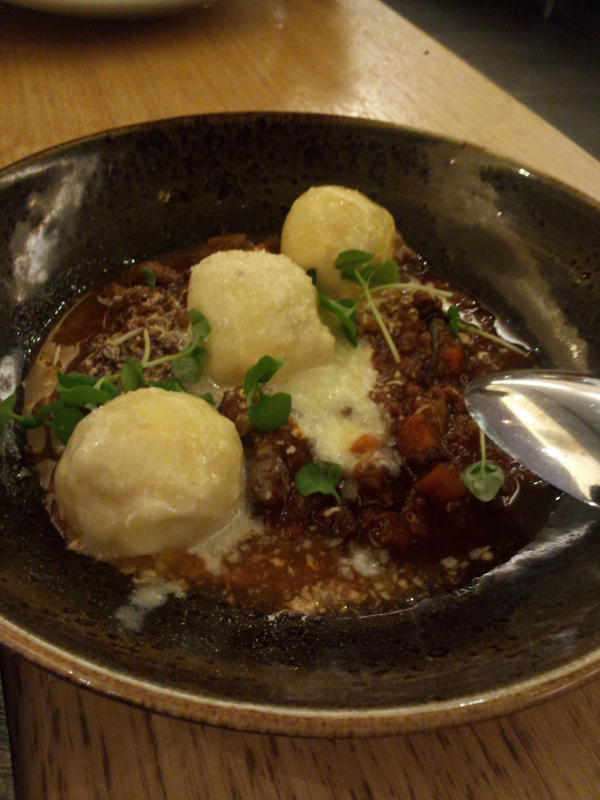 Steven and I both ordered the ravioli with goat cheese, braised meat ragu, basil, and parmesan. Again, pasta, SO FRESH! It was seamless ravioli, which was pretty cool. They were like balls of ravioli. I love it. Now, here is where the extra food starts. I believe the chef/server/management must have found out I was a food blogger, because we were brought a 2 items as compliments of the chef. The first was this amazing summer squash dish;. The sauce on it was delicious. This was one of my favorite dishes of the night, and I usually wouldn’t say that about a vegetable dish. It was very nice of the restaurant to bring this out to us! 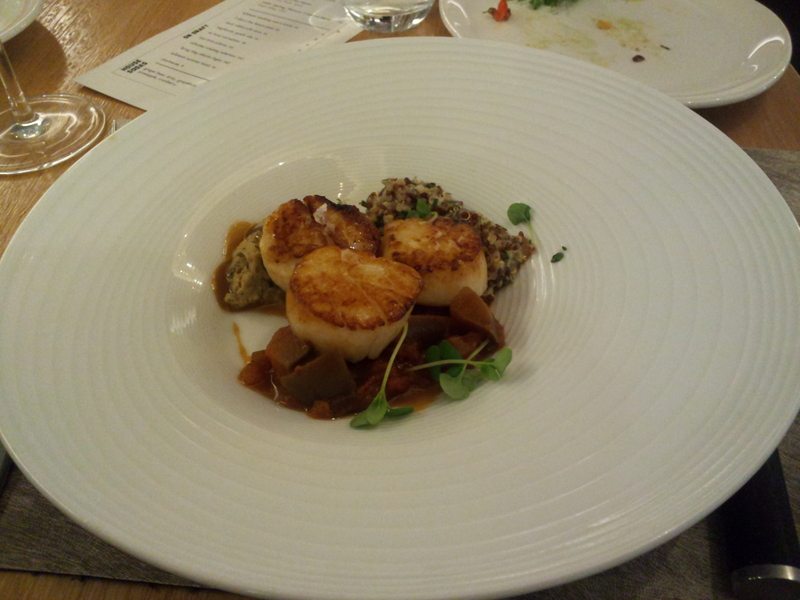 For entrees, Lindsey ordered scallops with sweet and sour eggplant, quinoa, and miso vinagrette. I love scallops. These were perfectly cooked, buttery smooth, and went well with the quinoa and veggies. 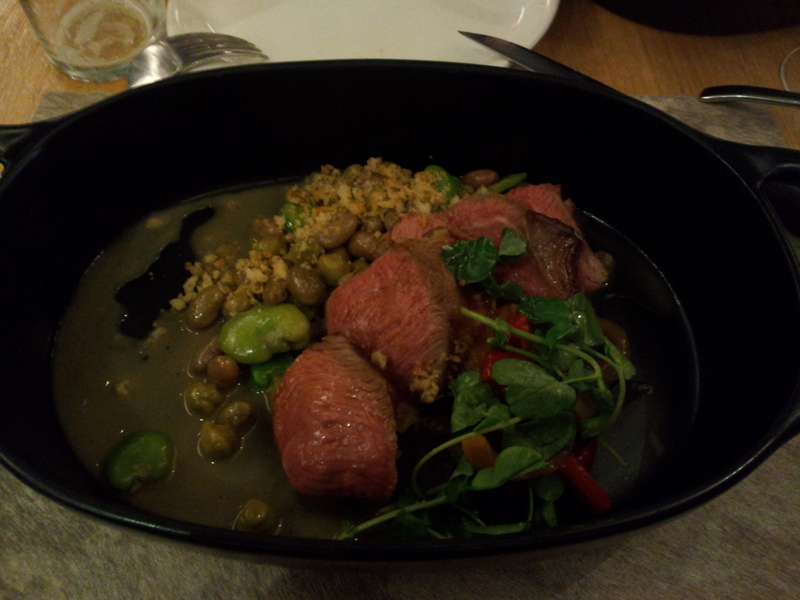 Steven ordered lamb leg with summer bean succotash and ember roasted peppers. Lindsey and I both don’t generally love lamb, yet this was her favorite dish of the whole evening, and it was definitely one of mine. Steven liked it too, but I think he liked the steak even more (keep reading for that). I loved the way the lamb meat was cooked, and the beans and veggies were again surprisingly impressive. 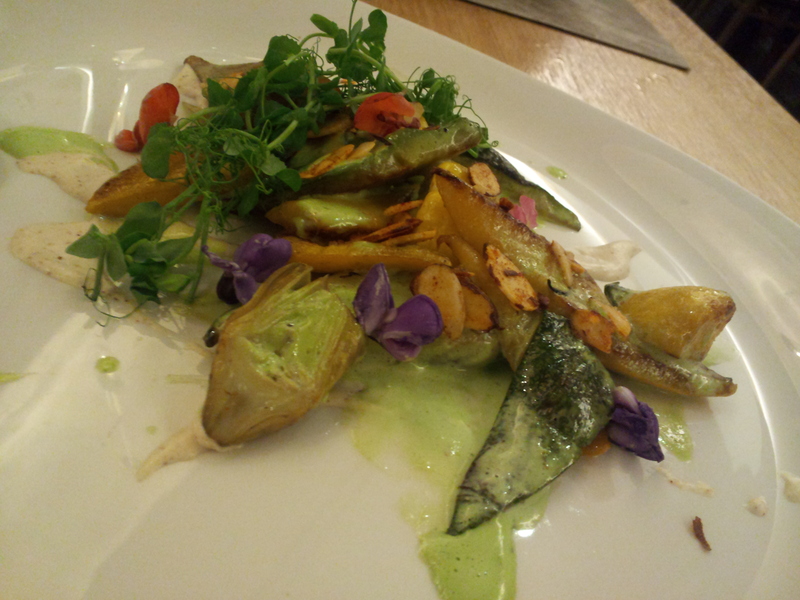 The vegetables really were a star of the night as a whole! 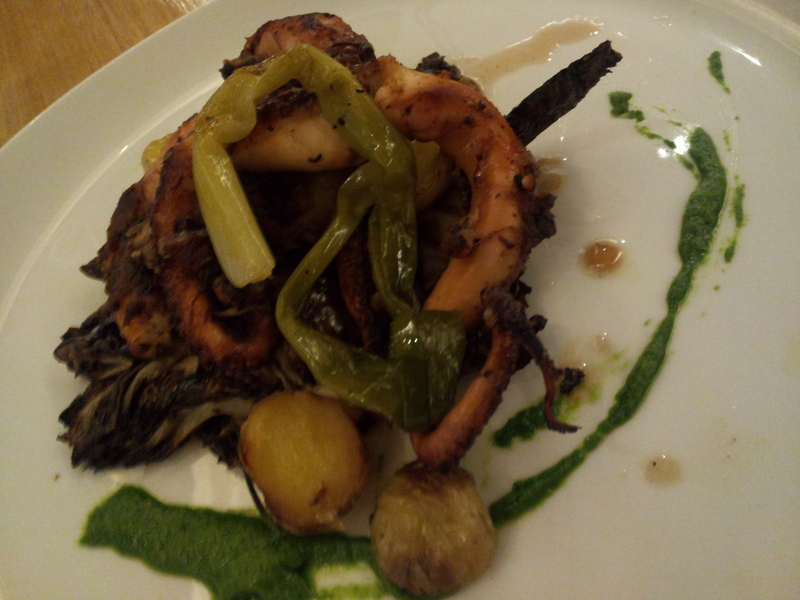 Yummmmmmmmmmmmmm I love Octopus. I don’t get to have it very often, so when I see it on a menu, it’s pretty likely I’ll order it. And, it was tasty! The cooked radicchio was notable as well. Delicious dish, I’d order it again. 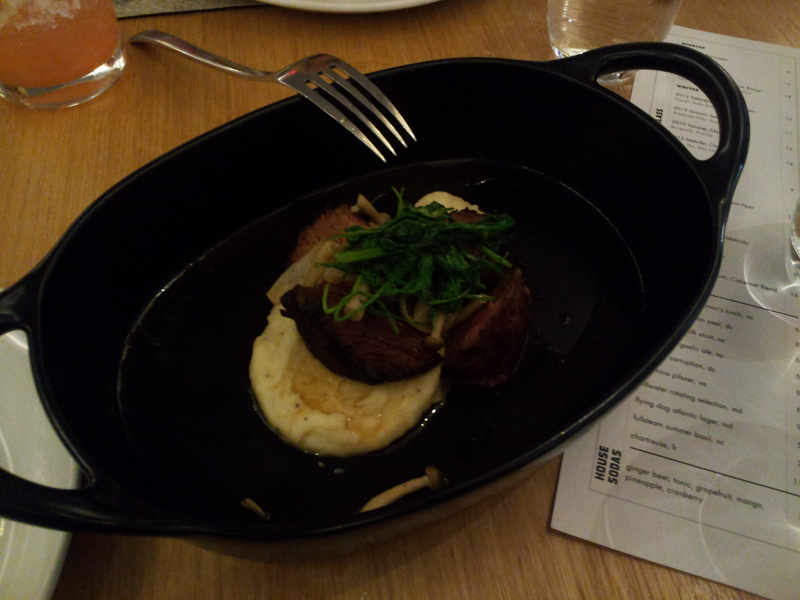 And now, for complimentary dish #2: sirloin with charred onions and pickled honey cap mushrooms. If you look back up at the menu, you might notice that this dish had an add-on price of $7. Again, very very thoughtful of the restaurant to give this to us! The steak was cooked medium/medium-rare, which was wonderful. The mashed potatoes were creamy & garlicy. And, I love mushrooms, always. Yum. Around this time in the meal, I ordered my second cocktail. I wanted to get the concessions of a dangerous mind, which is vodka, strawberry, ginger, and almond. Unfortunately, they were out of it! Must really be that good! I look forward to trying it the next time I’m there. 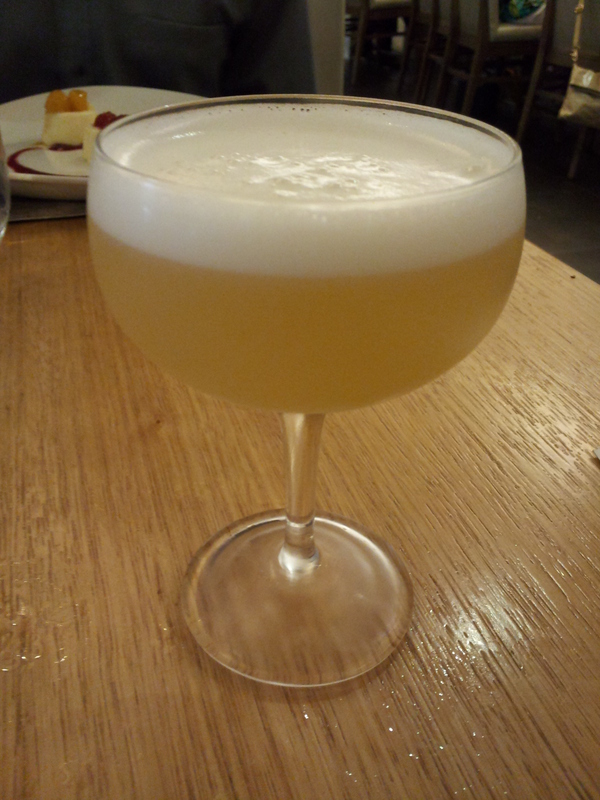 What I did order was the Los Rudos, a cocktail with mezcal, lillet, grapefruit, aji, and egg white. 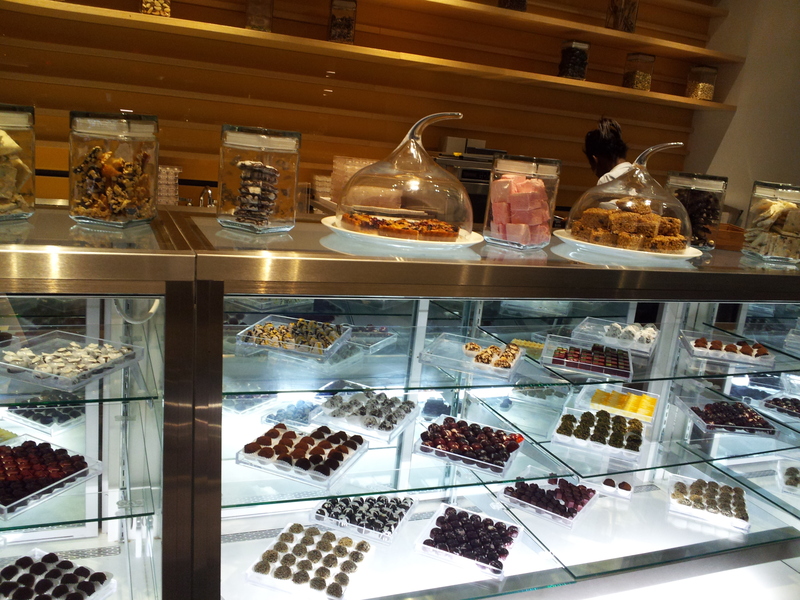 Now, the best part, dessert time! 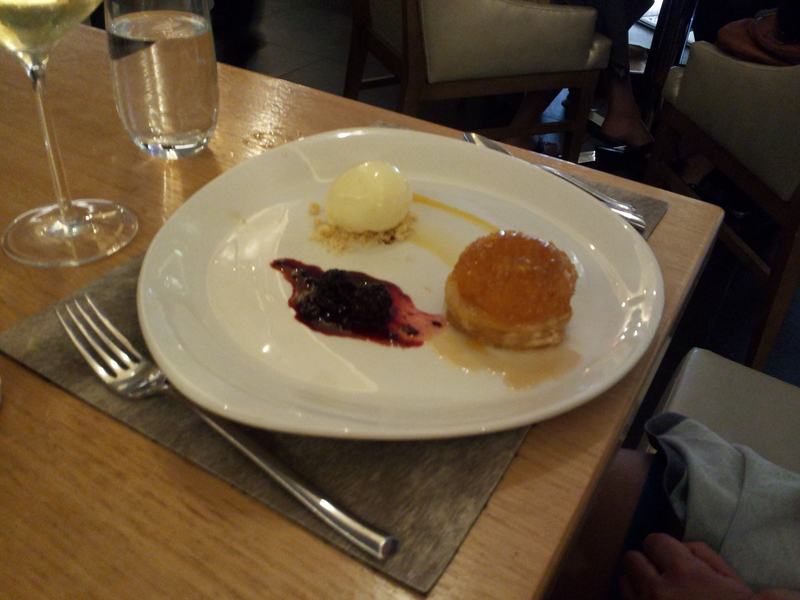 Lindsey’s dessert was peach tart tatin with blackberry and vanilla sour cream ice cream. Honestly, I was too infatuated by my own dessert and didn’t try this. But, trust me, it was amazing. Lindsey loved it. 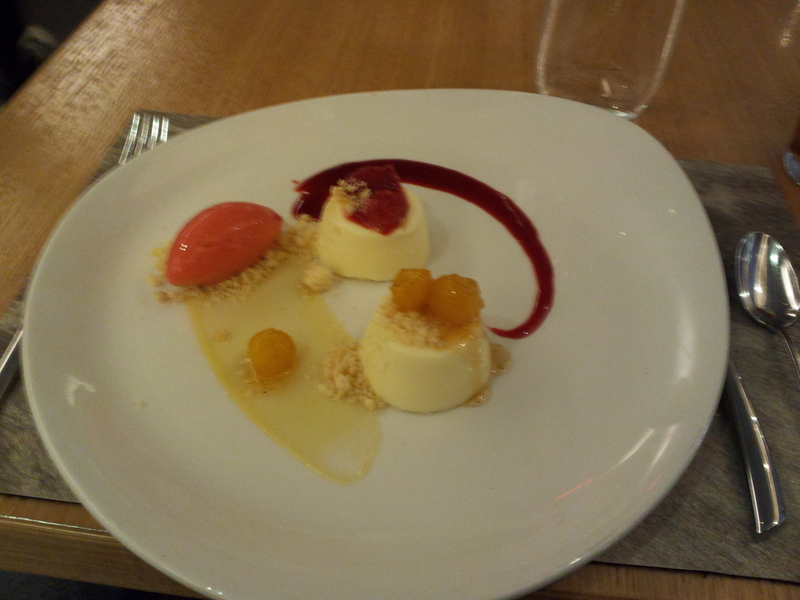 Steven enjoyed the cheesecake with caramel shortbread and black raspberry sorbet. Look how cute those cheesecakes are! I tried a bite– the cheesecake was creamy and luscious, just how cheesecake should be. That raspberry sorbet was SUPER fresh. As in, it was almost like eating a spoonful of actual frozen raspberries. I would assume it was made with real berries. 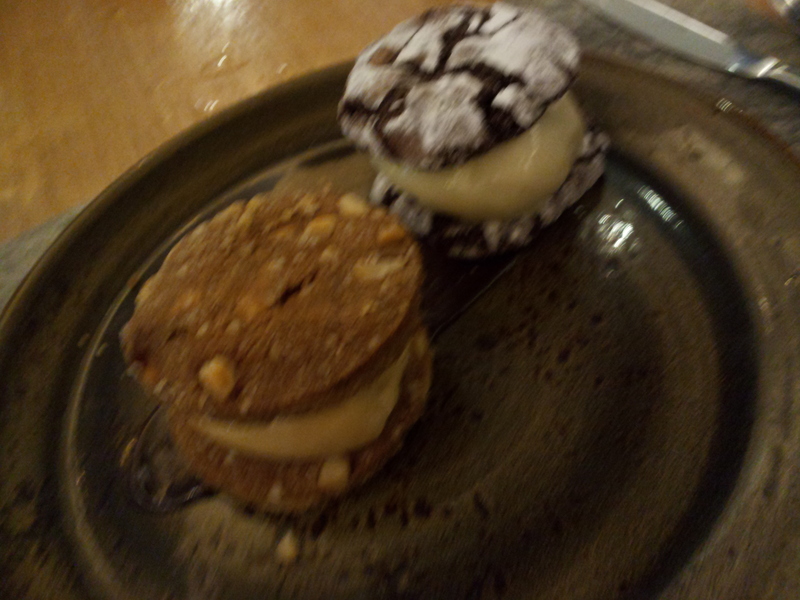 And finally, I got the ice cream sandwiches: a macadamia nut ice cream sandwich with salted caramel ice cream, and chocolate cookie sandwich with fresh mint ice cream. The mint ice cream was so fresh! (I’m sure you’re noticing a theme, freshness. Amazing) None of the artificial mint flavor you get in the store or from really any ice cream vendor. It tasted like fresh mint leaves. Very refreshing, and delicious with the chocolate cookies. The macadamia nut cookies were hard, which made biting into the ice cream sandwich kind of a challenge, but a delicious challenge. So glad I ordered these. Just my type of dessert. I would love to go back to Range soon. Try some more cocktails, other seafood, maybe a pizza– everything just looked amazing!! Overall a great pick for restaurant week. If I had to pick favorite dishes, I would probably choose the squash dish, the octopus, the lamb, and the ice cream sandwiches. And the goat cheese ravioli. 🙂 YUMMMMMMMM! So happy we went!!! Ever been to Range?  What were your favorite dishes? !